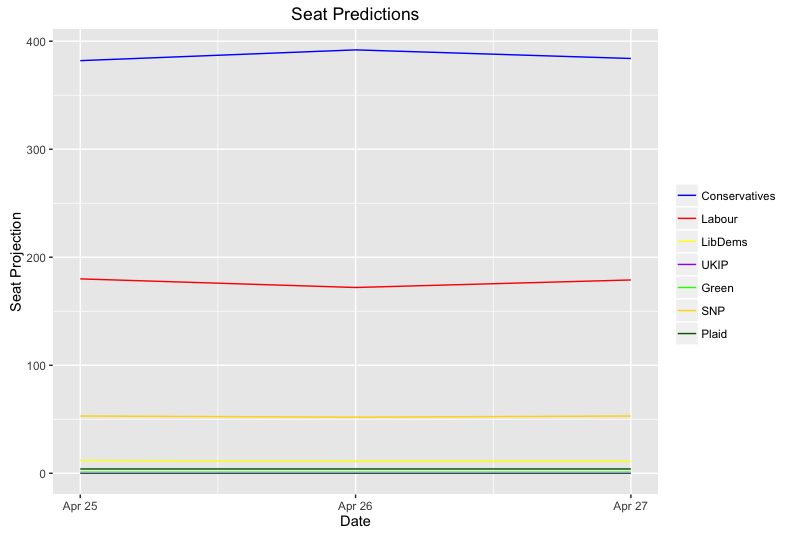 Today's YouGov poll (Con 45, Lab 29, Lib Dems 10, UKIP 7, Greens 3) has moved the 7 day rolling average downward somewhat for the Conservatives, but they still enjoyed a healthy lead. The updated uniform swing generated the following result: Conservatives 387, Labour 178, Lib Dems 7, UKIP 0, SNP 55, Plaid 4, Greens 1. This would give the Conservatives a majority of 118 (correctly calculated this time, thank you to those on Twitter who noticed that I got that particular sum wrong!). Down on yesterday's forecast, but still very healthy and would constitute a solid vindication of Theresa May's snap-election gamble. 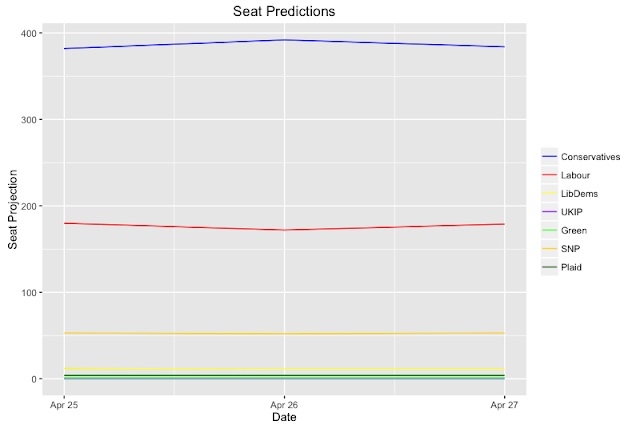 The graph below shows today's forecast moving back towards the initial result projected two days ago. Labour need a very significant shift in the polls in order to prevent the Conservatives from achieving exactly this sort of result. Unfortunately for them, it does not appear to be forthcoming.